Imagine you’re a quarterback. You walk up to the center, take the snap, and the defense descends on you like a pack of ravenous predators. You look to your first two reads. Both wide receivers at the split end positions are closely covered by cornerbacks. You look to your slot receiver — he’s covered. Just as you are about to checkdown to your running back to dump the ball for a small gain, you’re sacked. You get up, but you don’t feel any pain. That’s because you were never hit. 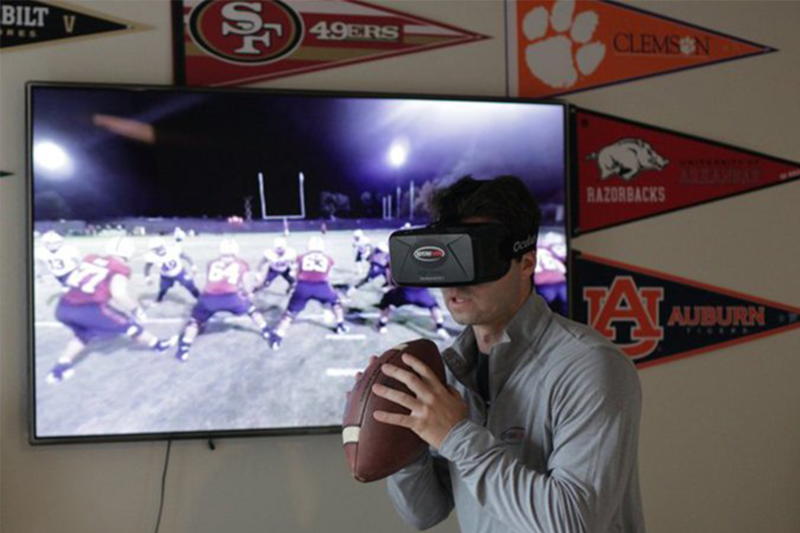 Welcome to the future of American football training: virtual reality. While this news might have made fans of opposing NFC North division teams chuckle given the Vikings perennial quarterback woes, it was nevertheless intriguing that a team with a promising second-year coach in Mike Zimmer would decide to incorporate virtual reality into its program at all. And the Vikings aren’t the only team testing the virtual waters. Recently, the New York Jets, another struggling NFL team, decided to give VR a go, joining the Dallas Cowboys, San Francisco 49ers and Arizona Cardinals in the virtual realm. At the NCAA level, the Stanford, Auburn, Vanderbilt, Dartmouth, Rice and University of Arkansas football programs are also using the system. And, as the technology matures and costs are lowered, VR training will trickle down to high school football teams. STRIVR Labs, the company behind the Vikings’ virtual reality quarterback training system, believes their Oculus Rift-based system will change how teams train and prepare for opponents. STRIVR features a 360-degree camera and audio system that captures all on-field action, allowing the user to relive a play as if they were there. Teams can use it to record immersive for one-on-one drills and team segments, as well as for simulating opponents. Founded by brothers Derek and Danny Belch, former NFL quarterback Trend Edwards and Jeremy Bailenson, STRIVR Labs grew out of Stanford University’s Virtual Human Interaction Lab, which has also launched VR projects aimed at enhancing empathy and promoting eco-consciousness in users. STRIVR Labs stands out in the virtual reality industry: its team isn’t just Silicon Valley technologists. Apart from Bailenson, the company’s founders mostly come from the world of sports, where technology is usually spent on stadiums, physical training, film study systems and some performance data crunching. One of those intrigued by the potential of virtual reality training was Dartmouth College football’s Director of Football Operations Joey McIntyre. After seeing reports in the national media of virtual reality being used by sports teams, McIntyre called Matt Doyle, Director of Football Operations at Stanford, who put him in touch with Derek Belch. Teevens and his coaching staff decided they wanted to see STRIVR for themselves before making a decision. McIntyre says that Dartmouth intends to use the system in a broad way. While the most obvious application is for quarterback training given that the position requires the reading of and reacting to defenses, Dartmouth plans to use the system for all position groups. When used with kickers, virtual reality gives the kicker additional reps to mentally work on body placement and kicking technique. When it comes to punt protection, the “shield guys” can virtually go through all of the different defensive looks, simulating reps that might have been missed on the field. McIntyre says that STRIVR will also serve as a type of “virtual playbook” for the team’s younger guys. During the preseason, they may only get 10 to 15 reps per practice. But if they want to go back and “redo” the reps, or get even more, they can do so virtually. They can essentially put the headset on and watch the first team (the starters) live and in full speed, which should prove invaluable in accelerating the training. STRIVR is aiming to be an additional tool rather than a replacement for traditional birds-eye and sideline view training film. In addition to those time honored training methods virtual reality offers a first person perspective that will hopefully increase the players ability to learn and intensify reflexes. McIntyre also sees virtual reality as integral to game planning. During the preseason or regular season, Dartmouth can simulate looks from its various opponents. The offense, for instance, can virtually experience the defensive “looks” (coverages) typically used by teams like Harvard, University of Pennsylvania and Columbia University. Teams typically do this with on-field walk throughs in the days before the game. Virtual reality could alter this strategy. McIntyre sees virtual reality training as the wave of the future, not just in football but across athletics. It may prove difficult in lacrosse and hockey, sports that are fast and really never stationary like football or baseball. But McIntyre says that if STRIVR or other virtual reality sports systems can put together a package that tracks fast movement, then lacrosse and hockey could also use virtual reality. Another upside to virtual reality in sports for NCAA teams will be found in recruiting value. A big part of McIntyre’s job is national recruitment. Ideally, Dartmouth — like any other team — would love to bring potential student-athletes to the campus for a visit. If this can’t be done in-person (initially), then McIntyre believes it can be accomplished virtually. In this scenario, the player could be shown the inside of the football stadium, taken through the workout facilities, the rehab space, to what his locker room would look like. The VR headset could show him the outside of the stadium when fans are there, and the inside of the stadium for that matter. The recruiters could even show game footage shot with a 360 camera and sound to put them there virtually for that experience. They could even show them some footage of practices so the recruits could know what it feels like to be in the huddle on either offense or defense. They could meet the coaches and other staff members virtually, and some of the veteran players. With a mobile rig, the recruiters could also show the player around the larger campus. Show them where student athletes hang out, and where other co-eds congregate. So far, Belch says the STRIVR team hasn’t encountered many skeptics. And while there are no solid statistics on how effective the STRIVR system is just yet, head coach David Shaw at Stanford points to QB Kevin Hogan's use of the system as one of the reasons he performed so well at the end of last year, finishing the season 3-0 including a win over top-10 ranked UCLA on the road and a big win over Maryland in the Foster Farms Bowl game. Belch says that STRIVR’s “end game” is all about data and analytics. “We are already in the process of creating predictive analytics for the teams we are working with based on how their players behave in the virtual environment,” he says. Will fledgeling quarterbacks soon be training in their living rooms? We don't know, but technology makers are definelty invested in the prospect.